Thanks to Nintendo giving multiple reporters another chance to try it this week, we have seen plenty of new details about the upcoming remake, The Wind Waker HD. Among this new information was some confirmation of previously teased news but there were also a few newer tidbits in there that we hadn’t heard before. One of the notable new bits of news was new info about the Picto Box item. Not only is this wooden camera available in full color from the start of the game, but it has also received a few nifty new features. Jump inside to see. 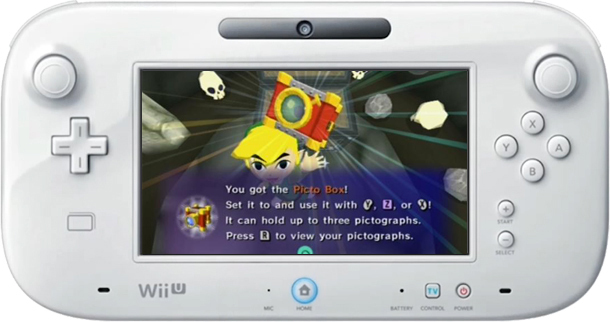 In addition, we even get a chance to see this new “selfie” feature in action thanks to a video from GameXplain. Jump to about 2:10 in the video below to see it. Part way through his description of the new features, GameXplain’s reporter also mentioned a detail about the Picto Box that certainly makes me ecstatic: its capacity has been increased to hold twelve shots instead of just three. As a player who absolutely loved filling the Nintendo Gallery in the original Wind Waker, I find the prospect of packing four trips’ worth of images into just one to be amazing. Perhaps we can also see some streamlining to the process of submitting photos to Carlov as well? So what are your thoughts on these new Picto Box features? Do you like the idea of being able to share funny pictures of Link over Miiverse? How about that increased capacity and having a full-color box available from the start? Let us know your thoughts on these revealed features in the comments!